Moisturizes & revitalizes. Free of: sulfates, parabens, phthalates, gluten, drying alcohol and artificial colors. 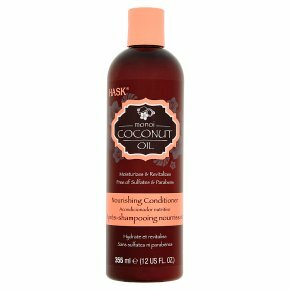 Not tested on animals.Hit the snooze button and give your hair a tropical vacation with Hask Monoi Coconut Oil Nourishing Conditioner. Infused with softening monoi oil, a blend of Tahitian gardenias and coconut oil, to hydrate and strengthen, this conditioner helps protect against damage by softening and strengthening, leaving even the most lifeless and frayed hair soft, smooth and detangled. Ideal for all hair types. Directions: Apply to wet hair. Leave on for 1-2 minutes. Rinse thoroughly. Ideal for daily use. For best results, use the Hask Monoi Coconut Oil collection. CAUTION: AVOID CONTACT WITH EYES. IF PRODUCT GETS INTO THE EYES, RINSE WELL WITH WATER IMMEDIATELY.